Hi y'all! I love scraps. In all the years I've been sewing, I've never been able to get rid of any leftover fabric if I felt it was big enough to use in something else. That being said, I have a TON of scraps. And until about a year ago, those scraps sat in bins. Waiting. Just waiting. Sound familiar??? 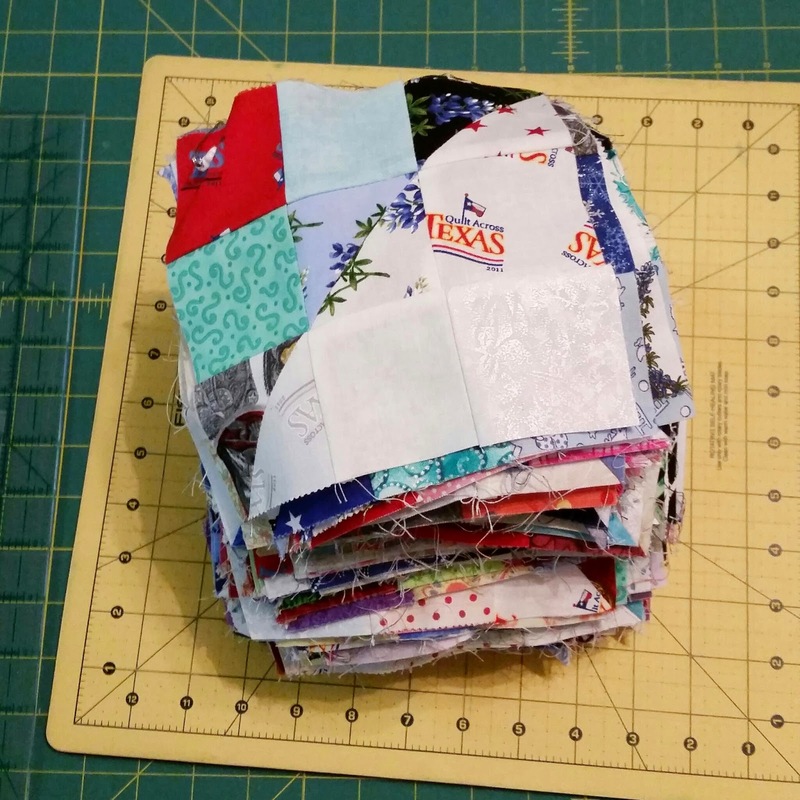 So since She Can Quilt and Mrs. Sew and Sow have started this fabulous new linky called Scraptastic Tuesdays, I was inspired to stat sharing how I've started to wrangle the scrap monster. Step One: Admit that you have a problem! I know, I know, sounds cliche' right? But it's true. You can be a scrap hoarder or a scrap user. But you have to admit to yourself that you've been just collecting scraps before you can get yourself to start USING them!! Step Two: Start cutting your scraps into usable sizes. This step held me up for a long time. What size should I trip them to? What if I cut something down and later needed it a bigger piece? But the simple fact is, you haven't been using it because it's in the dreaded scrap bin. If you have it sorted and cut into usable sizes, you may actually use it!!! 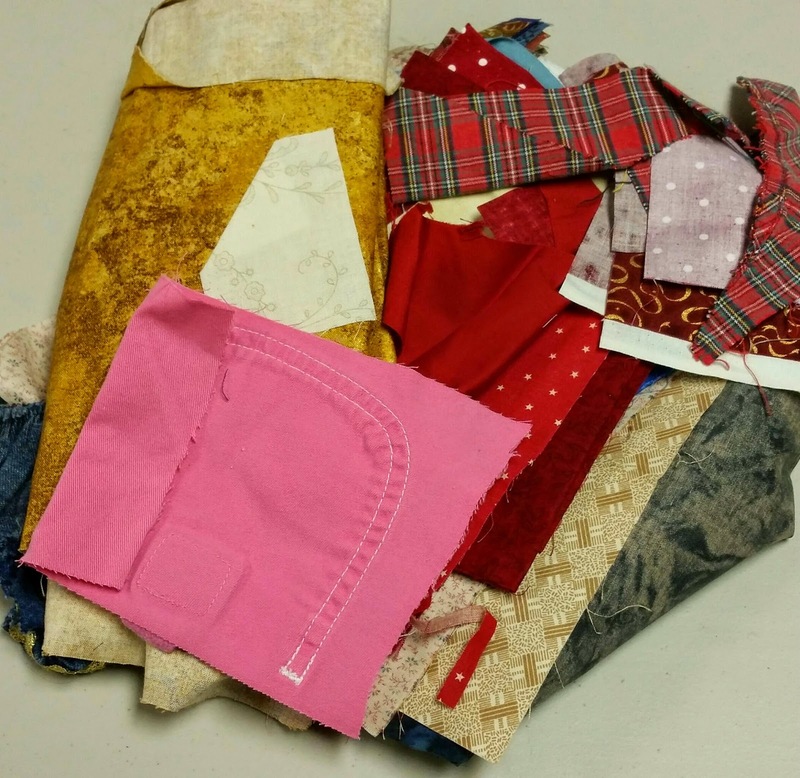 Once I started getting my scraps cut into usable sizes, I was at a loss as to what to do with them. I stumbled across Bonnie Hunter and read about her scrap system and just about the time I was starting to tackle my scrap problem, she was starting a leader/ender challenge. I took that as a sign that I was supposed to start there. The basic premise of a leader/ender is that when you are doing your regular sewing, you end your stitching with sewing two pieces of fabric together (like 2 - 2" squares) and leave it under your presser foot. You start your next sewing session by feeding it directly behind this piece, like chain piecing. Then when you end, you feed another set of scraps through. Thus the scraps become your leaders and enders when stitching. You use less thread and are sewing a project in between all your normal stitching. The first leader/ender project I tackled was a split nine patch. I just finished the last block that I needed over the weekend. I've learned quite a bit working through this leader/ender project and have already started another one. 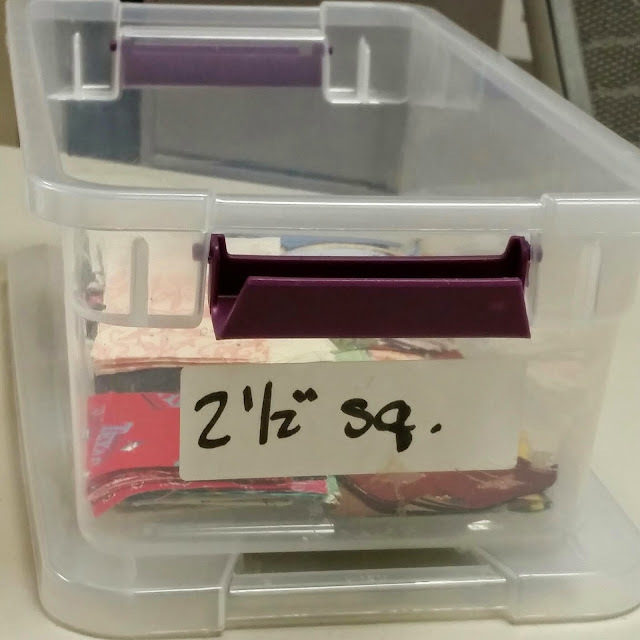 My 1-1/2" box was overflowing so I decided I'm going to do some 36 patch blocks. This first leader/ender was "anything goes" as that is the way Bonnie teaches it. 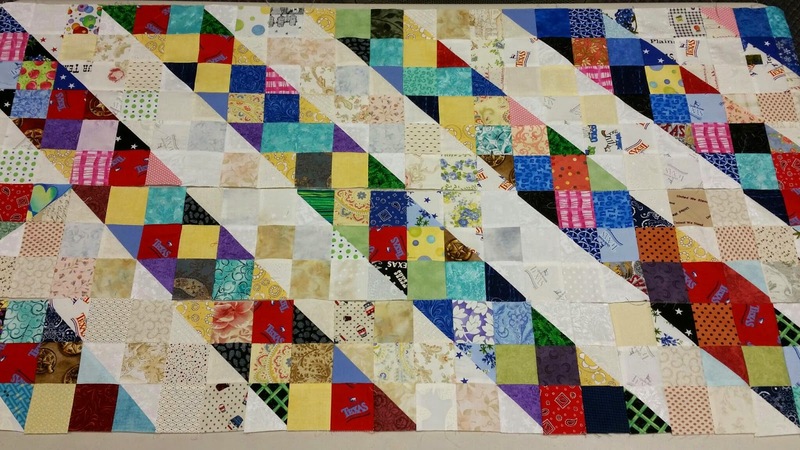 I discovered that I really prefer a more controlled scrappy look, like I used in my Scrap Jar Stars quilt. So this new leader/ender is going to be a more controlled palate. You've packed loads on info in here! Thanks for letting me know about your post and yes I want to become a scrap user! You have motivated me into sorting my scraps ! what you said about putting it off because of indecision regarding the size of the scraps really rang true. Thanks for the inspiration.